We are thrilled to have added to our farm the premier Rose Grey male of the 2010 show circuit. Jetson's Sir William! (Willie) was undefeated in 10 shows as a yearling and 2 year old male. Considering the competition included MAPACA, the largest show on the East Coast and other shows in Ohio, Maryland, Virginia, and Georgia, we feel that Willie has matched up against the best grey males in the industry. With banners in all 3 age groups, Willie has proven his ability to maintain all the characteristics you are looking for in a herdsire. Willie's strengths are his amazing density, long staple length, high definition crimp from skin to tip, uncompromising conformation, and super genetics. His sire STF Jetson was the premier black male on the show circuit for two years. 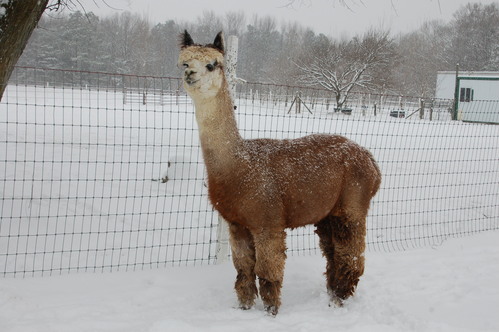 Along with Willie's rose grey dam, the genetics include Black Royal Forest, Bueno, Dakotia, Don Timbo, Jeronimo and Guellermo. That's a solid lineup of genetics known for fabulous fiber and outstanding color. 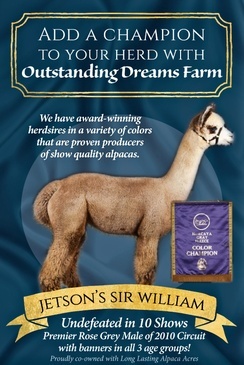 Willie's first cria have arrived and have proven his ability to reproduce fine fiber in a variety of stunning colors. 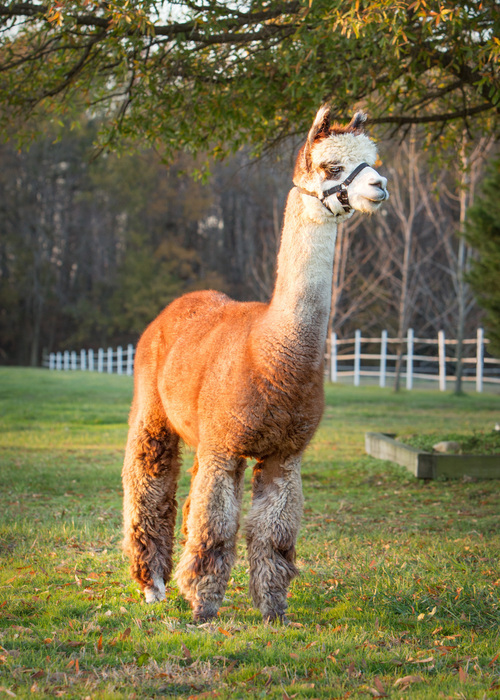 Look for pictures of his black and grey cria coming soon.